Farmers in the territory of Yatsushiro Agricultural Cooperative (JA), one of major tomato producing areas in Japan, have entered their busiest season of harvest in the year. A tomato grading facility of the JA Yatsushiro, however, is now suffering from a lack of part-time workers. A number of those workers have been evacuated at public shelters taking off at the grading house since the Kumamoto earthquake hardly struck the area on April 14. 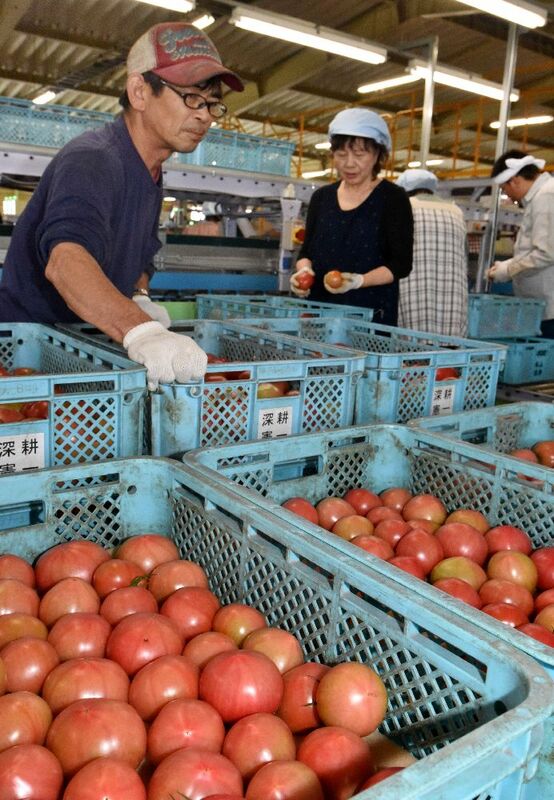 With a view to coping with the shortage of part-time workers, member farmers of the tomato producers’ group of JA Yatsushiro decided to fill the vacancy of grading and packing workers at the facility by themselves. In the JA Yatsushiro area, the tomato season is now at its peak. More than 160 tons of tomatoes are brought into the grading house by member farmers every day. After the Kumamoto earthquake bitterly hit this area, 180 part-time workers, accounting for about 40 percent of the total workforce at the facility, have been unable to come up to the facility. They are still forced to stay at schools and other community shelters. The JA tomato producers’ organization, consisting of 380 member farmers, is now carrying out a workforce management program of the grading facility in collaboration with their JA Yatsushiro by posting 180 farmers every day as grading and packing workers at the facility. These farmers are divided into a morning group and an afternoon group of 90 members respectively. This entry was posted in Others and tagged News. Bookmark the permalink.